Nikos bikes is in the area of Tigaki in Kos island. For several years now it offers high quality services in the field of moto and bike renting. Here you will find a wide variety of bikes appealing to all tastes and ages. 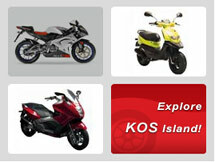 Bikes for children, baby trailers, baby seats for bicycles, as and Yamaha, Aprilia and Piaggio bikes for adults. Nikos bikes wishes you a nice and safe holiday. Please drive slowly, be careful and have fun!